Depends on which trail you decide on. There is a $6 day use fee, or free/donation parking just off Forest Road 543. 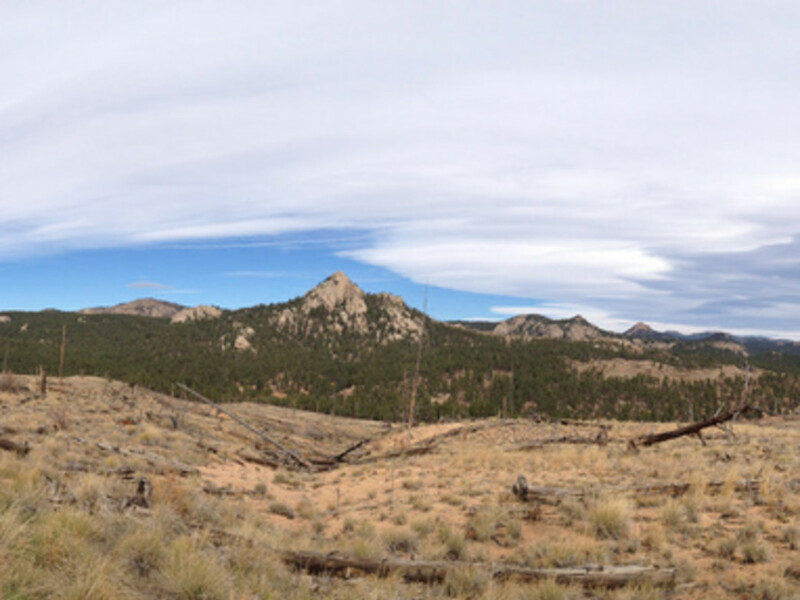 Buffalo Creek is part of the South Platte District of the U.S. Forest Service, and it features miles and miles of great multi-use trails, mostly a collection of single-track and old fire roads. Located about an hour west of Denver and an hour and a half from Colorado Springs, Buffalo Creek was the site of a massive wildfire in 1996. Today, it is best known for the challenges it presents to mountain bikers. Many of its trails are perfect for moderately skilled riders, with some areas of sandy surface that make downhill sections challenging and angled granite slabs that will challenge even the most been-there-done-that kind of riders. Trails here take riders through some deeply forested areas, as well as the still-barren remains of the fire that torched nearly 12,000 acres and the aftermath of a massive flood that killed two people. It was a fierce fire, and the destruction will be visible for decades. Most of the trails are perfect intermediate cruises with a bit of challenge, but two of the newest ones are among the most difficult trails around. The impressive trail system is the result of a partnership between the Forest Service and the Front Range mountain biking community. That partnership, which involved hundreds of volunteers over a span of years, is best seen in the new Raspberry Ridge and Blackjack trails. Super steep, Blackjack has earned the title of one of the most demanding trails along the Front Range of Colorado. Steep slabs of granite form the backdrop for this trail that heads through the center of the burn scar. Bikers rave about its thrills and many have given it black diamond status (which means that, like a black diamond ski run, it requires expert skills). The Colorado Mountain Bike Association organized dozens of work days to build the new trails, and the group went for challenges that were more technical than had ever been seen in Buffalo Creek before. To reach these new trails, start at the Buffalo Creek Recreation Area trailhead (directions below); ride up FS Road 543 and ascend Sandy Wash and Homestead Trails to Raspberry Ridge; take that to Blackjack. It’s about a 12-mile loop. This area is popular, but big enough to hold a crowd without feeling crowded. Some of the trails here (especially on expert trails including Blackjack) will leave you breathless. If you can conquer them, you’ll never forget them. From Colorado Springs, take U.S. Highway 24 west to Woodland Park. Pick up Colorado Highway 67 north and follow to Deckers. Turn left on Highway 126 to Buffalo Creek. Trailheads are located at Forest Road 550 and Highway 126 and at Pine Valley Ranch, off Highway 126 near Pine, and Miller Gulch (Forest Road 552). These serve north and west sections of the area. To access the area quicker than using Highway 126 through the town of Buffalo Creek, use County Road 68 southeast of Bailey.